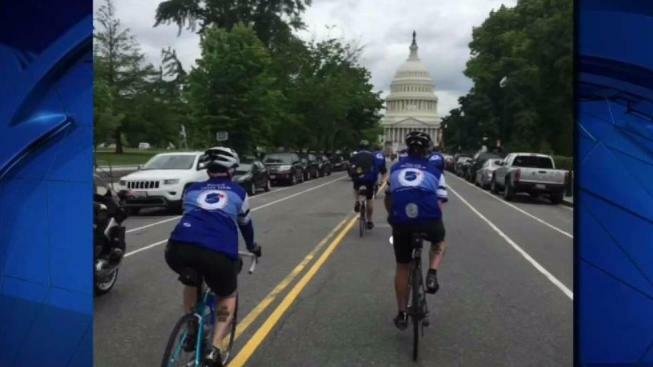 Three southern New Hampshire police officers are riding bikes in 21st annual Police Unity Tour to remember their fallen colleagues. The officers will ride from New Jersey on May 9th to Washington D.C. and the National Law Enforcement Officers Memorial. On most days, Officer Terri Moore's mode of transportation is her Windham, New Hampshire police cruiser, but next month she'll be peddling 300 miles in memory of her husband. "A great man gone too soon," said Moore. Matt Moore was a police officer in Hampstead. He died of brain cancer in 2016. "[We] always wanted to go down me and my husband, but it never happened," Moore said. "Unfortunately after he passed I put it on my bucket list to do that." 'That' is the Police Unity Tour for charity. Participants have to raise $1950 to qualify to ride. This is Moore's second year riding. She'll be joined by Hampstead Officer Dave Cianfrini and retired Plaistow Officer Steve Ranlett. "She said she wanted to do it for Matt who passed away and for her two daughters and I wanted to be there to support her," Ranlett said. remembering," Cianfrini said. "It becomes a personal thing. It becomes a way of life." So personal the officers got matching tattoos with the unity tour symbol. "As I talk to you I choke up," Cianfrini said. "It's a sense of pride, it's a sense of sadness. It's a sense of accomplishment." "If your knee bothers you, or your back hurts, while my back can hurt for 300 miles but Sergeant Gannon can't go home and that's what goes through your mind the whole tour while you're doing this," said Ranlett. The officers described the emotion they feel while riding along the route as filled with chills and tears. Officer Moore said she rides to teach her daughters there's still more work to do. "It always falls on Mother's Day, but they understand that I'm doing Daddy's ride," Moore said." They're going to grow up knowing that we're going to pay it forward and that no matter what life gives you it doesn't define you, but you know what we do with that is what defines us." The officers will arrive in Washington D.C. On May 12th.